The PC and Phone should be connected to the same WiFi network. Doctors who are using Reception version with WiFi router will have this setup already. Doctors who have Single Doctor version and have a WiFi router can connect PC and Mobile to the same WiFi. 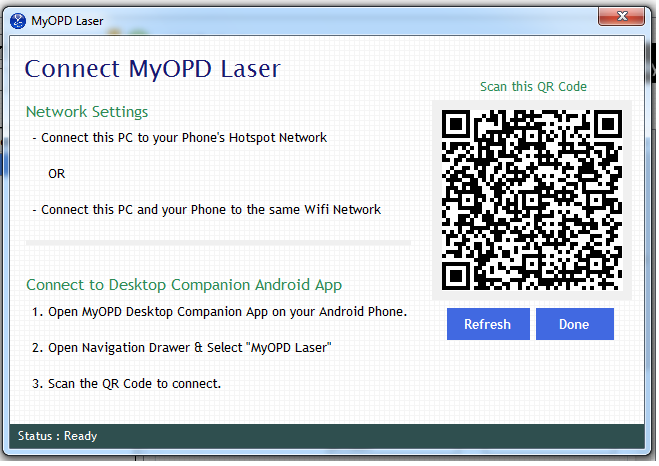 If you do not have WiFi router, turn on the Hotspot of your Mobile and connect the PC to your mobile's Hotspot. This way, your PC and mobile will get connected. Tap the app Menu option on top left corner. Copyright © 2019 MyOPD Support Center - All rights reserved.